1. Of course, not enough women on stage. You would have thought that being the travel and tourism industry speakers would be fairly split between females and males, but noooo...we saw three high profile women in total, two of which were from finance and banking! Wanting to paraphrase Gay Vaynerchuck of Vaynermedia ( and more) fame who spoke (or better, had a real go at the industry about it) about content marketing the question is....In which century are you marketing in???? Because obviously if the industry is serious about raising the profile, attracting the talent and pursuing the growth, it needs to be a lore more inclusive when it comes to the audience! 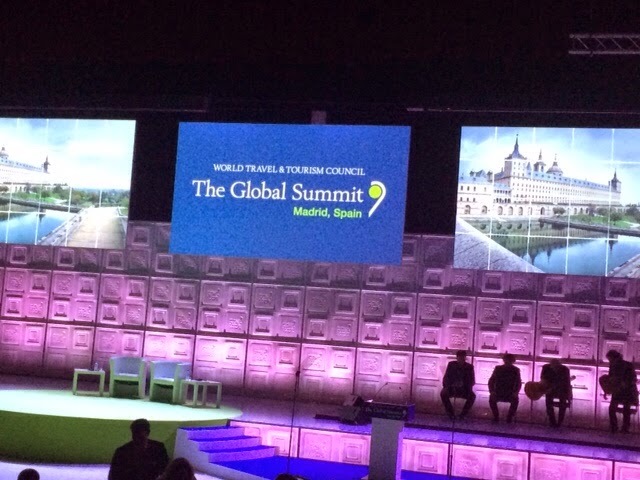 Part of the issue is that there are not all that many women in top roles in the industry so the issue is clearly greater than the actual WTTC Summit..But as many females were in attendance, they could scarcely feel the panels reflected their gender, let alone providing role models etc. BTW, it was ditto for race and diversity in general! Luckily the conspicuous lack of females speakers was noted by many so I do hope this will be addressed at the next Summit. As AIG Travel boss Jeff Rutledge said, 'Disruption is the new disruption' which means our lives are forever disrupted and there is nothing we can do except preparing for it and learning to accommodate it everyday as the new normality. From economic recession to terrorism, these disruptors have a massive impact on the way we do business, deal with our customers or indeed behave in our life. And it is not just about the big business, individual or small businesses are just as impacted. If anything, as individuals and/or small businesses we have on our side the ability to be flexible, nimble and as much as possible proactive and dynamic. The other side of the coin is that we do not have the big budgets to help us, but actually, technology is a massive and relatively cheap or indeed free tool we can use for this purpose. It is interesting that technology at the Summit was treated as much as a disruptor as it was a reinventing tool, a saviour. I do believe that once small businesses understand the power of technology and in particular social media, we can actually rapidly become huge beneficiaries. Possibly more so than mammoth size businesses for whom staying close to the customers is a relatively hard feat...remember it is all about CONTENT, content and more content! 3. Enjoy, discover, network, have fun! Gosh, did I really need to fly to Madrid and attend the Summit to learn this? Not really, but being out there for 48 hours was a powerful reminder that never mind your industry, your business or your sector, it is all about the people and the human relations! I really had a great time making new connections, talking to people from all kind of backgrounds and uncovering their interests and their story. Everyone has a story to tell and something valuable to share! It is actually quite humbling - but also inspirational - to see how much drive, talent and passion is out there. So here is to people, places, passion and ...preparation! And if preparation is something you need help with...then contact me to discuss how I may be able to support your professional and personal needs either as an individual or as a business.